The 2018 hurricane season is beginning a bit early this year as Earth Science Associates has been tracking the second disturbance with a chance of storm formation this week. If you are unaware, three years ago ESA developed and implemented a system that uses the National Hurricane Center's (NHC) disturbance analysis to make forecasts on where the system will move if it were to develop into a cyclone, many days before the National Hurricane Center forecasts a path. 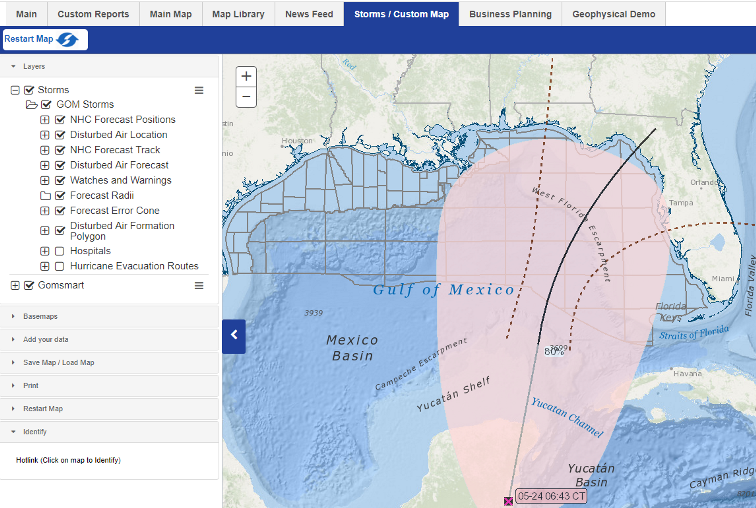 This tool for advanced planning is available in both the Storms/Custom Map section of GOMsmart and from the What's New section of GOM3 in ArcGIS (the red exclamation point). Because the season will not begin until June 1, the hurricane center is not releasing updates to these disturbances on their normal six hour cycle, though of course it will jump to a three hour cycle if a cyclone forms. The image below shows the GOMsmart Custom map with the disturbance location and likely area of formation in pale red (because the likelihood of formation in the next five days is over 70%). The tracks are estimated by Earth Science Associates using all of the past Atlantic storms since 1950, weighting them by trajectory and time of year, with the bounding dashed lines showing the 67% prediction intervals. 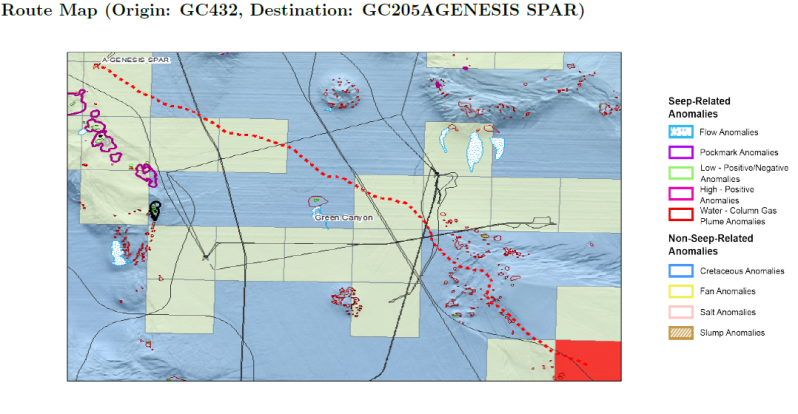 Also as a reminder, the Custom Map in GOMsmart has been modified to begin on the block specified rather than an overall view of the Gulf. It may require zooming out to see the current storm forecast. If your map does not begin zoomed to a specific block, click the Restart Map button to clear the previous location. Download a sample report can be downloaded here. For more information on the Business Planning Add-on, please contact us at contactesa@earthsci.com.